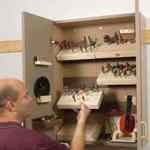 Using inexpensive MDF, hardboard and pine material, you can create a cabinet that offers great storage for router bits, bushings, wrenches, safety gear and anything else you use with your router. The cabinet can also be easily hung in a convenient location, like the side of your router cabinet or on the wall. Five different holders let you keep items organized and handy. Lift out bit holders keep bit groups together and easily accessible. 32mm template system makes hole spacing easy and convenient. Scrap pieces from your workshop would be sufficient to build this cabinet.